Children have a way of finding hazards in the bathroom, living room, and kitchen you might never have suspected were there. The bathroom and kitchen, with their sharp objects tucked in drawers or chemicals stashed in cabinets, require extra steps to ensure child safety. And the living room could probably benefit from a few well-chosen home safety products to eliminate major hazards to little ones. These kids home safety tips can help you keep big and little bodies inside safe. Kids homes safety tips for bathrooms. With water everywhere, the chance for slips, falls, and scalds is heightened in this small space. Here are some easy, effective ways to mitigate the bathroom dangers to kids at home. Pad the tub faucet to prevent burns and bruises. But don't stop there - the bath tub is also a slippery spot, so you'll want to place non-slip stickers or appliqués on the tub floor. The medicines we take and personal grooming items such as razors that we use in the bathroom present a very real danger to our little ones. So be sure to safely lock away medicines in a childproof prescription medication case , like this $28 portable model in blue. Always request child resistant tops for prescription medicines when you're filling them at the pharmacy. Keep razors well out of reach of curious hands, or in a bathroom cabinet with magnetic baby locks installed inside. Because a child can quickly drown in just inches of water, make a toilet-lid lock a part of your bathroom decor. And finally, remove soap that's become small enough to fit into a child's mouth. It's a choking hazard. In bedrooms, place beds and chairs a safe distance from window blinds and drapery cords. And remove any breakable knickknacks toddlers could easily knock off their perch and send spiraling to the floor. As every parent knows, most living areas aren't set up for kids under the age of three. Here are a few easy ways to childproof your living areas within spoiling the room's decor in the process. Pad sharp edges on furniture and raised fireplace hearths with inexpensive edge and corner guards, like this $21 set. Place non-skid backing on area rugs to prevent bruise-causing falls. Secure bookcases to the wall, and remove rickety furniture to ensure your living areas are safe for kids. The kitchen is the room where everyone congregates, and, consequently, it's a place where accidents can happen. 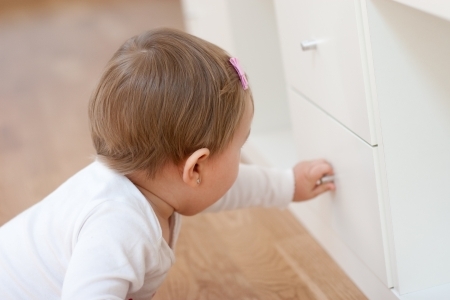 Install safety latches on drawers and cabinets to keep curious little hands from opening them. It's all the activities that go on here - cooking, cleaning, preparing food and more - that require an elevated level of home safety for kids. Remember to turn pot handles toward the back of the stove top when cooking, and to keep knives nd other sharp objects out of a child's reach or locked away in drawers or cabinets. Store plastic bags high and out of sight and reach of curious little hands. Install latches on kitchen cabinets . Store cleaning supplies inside locked cabinets. Be sure to latch the refrigerator door. Be sure to remove small refrigerator magnets (they're a choking hazard). As final kitchen safety tips in the kitchen, lock up trash containers, and don't use long tablecloths. A simple pull can cause heavy plates and cups to come crashing down on little ones. Install removable child safety window guards . Keep stairways clear, and install stairway baby gates at the top and bottom of the staircase. Cover electrical outlets with plastic plugs designed for the purpose. Keep wires, lamps, and lighting fixtures out of reach. Use sandwich bag ties or rubber bands to hold hanging cords out of reach. Make plants inaccessible to babies. Install sheets of rigid, clear plastic along stairway rails if they stand more than 4 inches (10cm) apart. Put decals on glass doors. Install knob covers on interior doors.